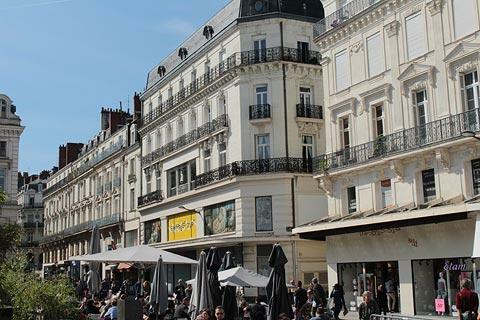 Angers is situated on the banks of the Maine river in the Pays de la Loire region, and was once capital of the Anjou region of France - it is the seat of a bishopric dating from the third century and prefecture for the Maine-et-Loire department. 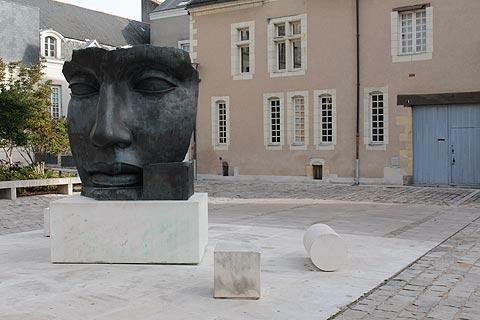 Angers is also officially listed as a 'Town of Art and History in France'. 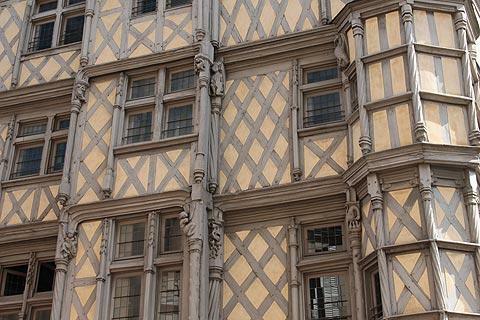 France This Way comment: Angers is a lively and large town with a lot of interesting monuments as well as a busy shopping centre and various museums and gardens to visit so we suggest you allow at least a day to explore and two days if you want to see all the sites of interest. 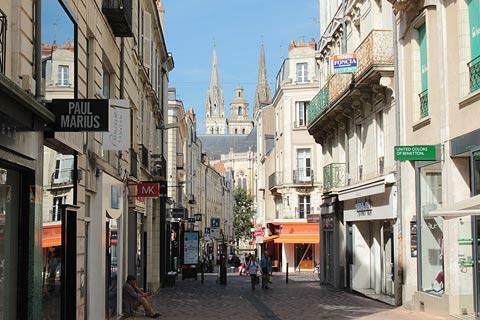 There are several car parks in the centre of Angers: the parking at Place de l'Academie is the closest to Angers tourist office and the castle so we suggest you park here if possible. 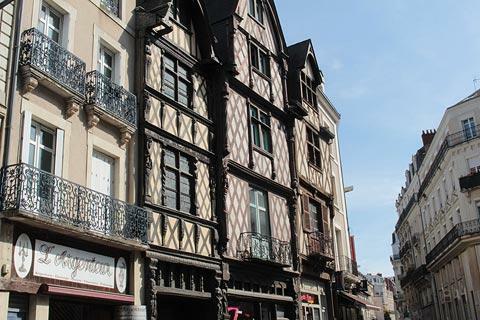 The town centre in Angers is quite compact and you can reach most of the major sites quite easily from the tourist office, but if you have time you will want to explore further. Start your visit in the castle next to the tourist office. 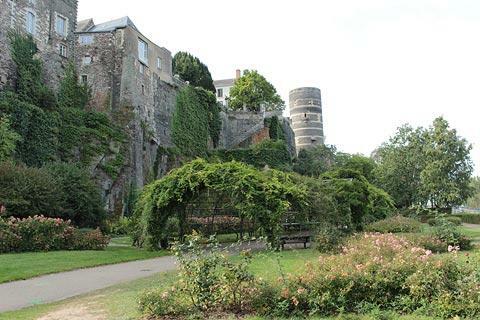 The massive and ancient Chateau d'Angers has 500 metres of ramparts and 17 towers, many constructed in stripes of alternating slate and limestone, and inside the castle there are gardens, several historic buildings and a ramparts walk to enjoy. As well as exploring the castle your ticket allows you to see one of the most important medieval tapestries in the world, the Apocalypse tapestry, which is in an exhibition area within the castle. See Chateau d'Angers and Apocalypse tapestry for details. 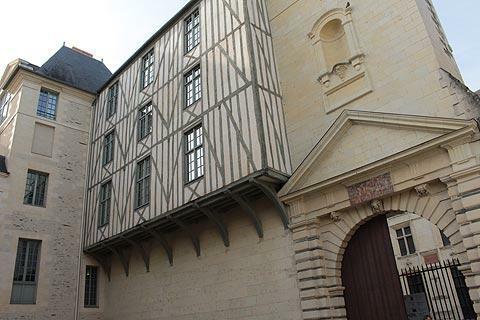 You will have seen views across the rooftops of Angers and the Maine river from inside the castle, and these continue when you leave the castle if you follow the Promenade du Bout du Monde (Rue D de Puycharic) to the north-east and in the direction of the cathedral. You will arrive at the cathedral its impressive twin spires up the flight of stairs that approach the main facade, where several impressive carvings and statues can be seen. Most of the cathedral dates from the 11th-13th centuries and is in the gothic plantagenet style, the first cathedral built in this style. Inside there are several features of interest including two large rose windows. See Angers Cathedral for details. Behind the cathedral in Place Sainte-Croix you can see medieval houses including the Maison d'Adam with several statues carved in wood decorating the facade. 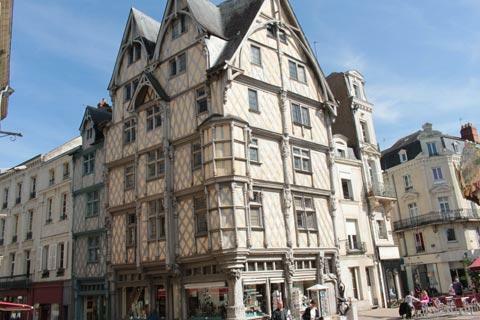 There are not a great deal of colombage houses in Angers but this is a remarkable group of beautifully preserved houses and our favourite square in Angers. 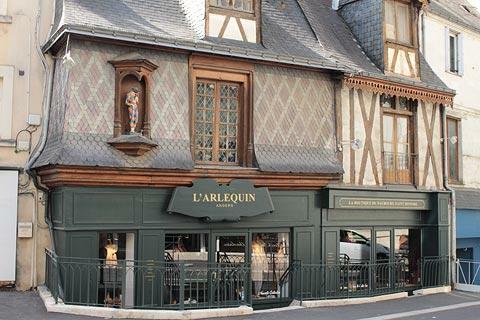 By contrast, a short distance north-east of Place Sainte-Croix on Rue Saint-Laud is the Alcazar Angevin, a 19th century Art Nouveau building that was originally a cafe called the Alcazar and is decorated with carvings of young ladies. 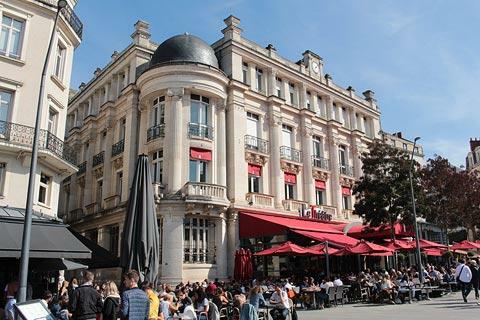 From here it is a short stroll along the Rue des Deux Haies to reach the bustling centre of Angers in the large square called the Place du Ralliement. 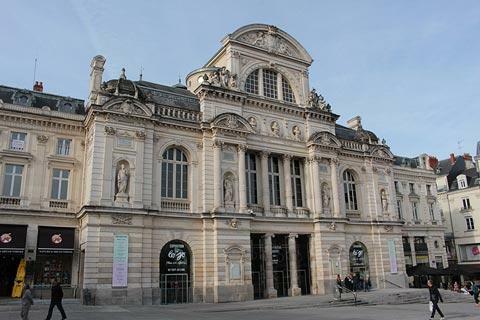 The square is surrounded by imposing 19th century buildings such as the theatre and has several cafes, and the surrounding streets are the main shopping centre in the centre of Angers. If you would like a moment of relaxation after all this activity there is a charming garden called the Jardin du Mail next to the Town Hall to the east of here which in summer is overflowing with flowers. 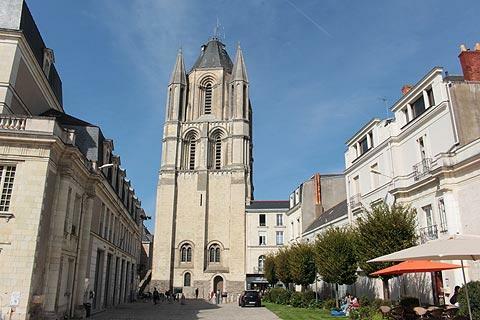 The Collegiate Saint-Martin is a remarkable building where you can see ancient crypts, various stages of the building that have been built over the last 1500 years as well as a large exhibition of religious statues and temporary exhibits of contemporary art. See Collegiale Saint-Martin of Angers. Close to here you can see the Tour Saint-Aubin, the 12th century tower that was part of the abbey. the Gallery of David d'Angers, close to the Museum of Fine Arts and in a 13th century abbey church with a glass roof letting the light flood in, dedicated to the works of the local artist David d'Angers, active in the 19th century: quite small but packed with great statues! While it is true that most people only visit the historic centre and major sites of Angers mentioned above, there are also interesting monuments on the other side of the Maine river reached across the 12th century Pont du Verdun (the bridge straight down from the front of the cathedral). It is also from the pleasure port here that you have lovely views across the river to the castle and can organise boat trips along the river. 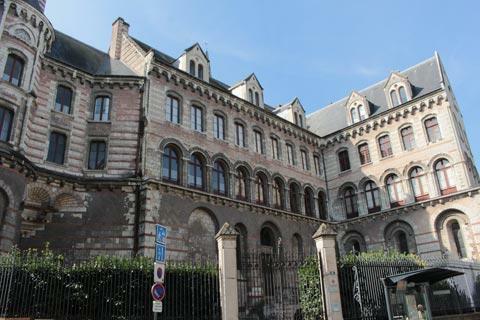 The principal sites are the Abbey of the Ronceray with the Church of the Trinity (Place de la Laiterie) and the Hotel des Penitents (Rue Descazeaux), a 15th century townhouse with towers and a gothic staircase. 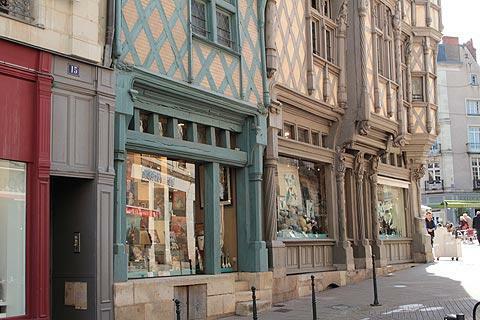 Rue Lionnaise is one of the best preserved medieval streets in Angers and the Place de la Paix a short distance north is surrounded by a good number of townhouses from the 15th and 16th centuries. 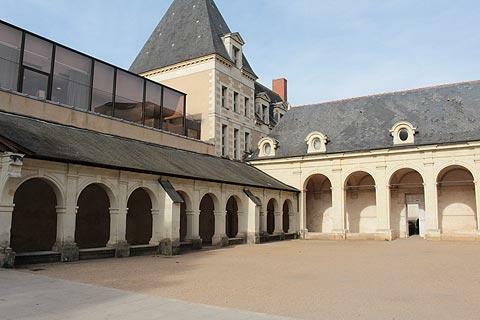 Another highlight is the Museum Jean-Lurçat where you can see comtemporary tapestries in the quiet setting of a 12th century hospital which also has gardens and cloisters to explore. 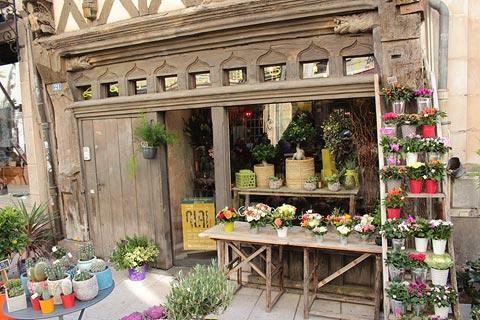 To the north of the town at Terre Botanica there are extensive gardens with ponds and greenhouses and many childrens activities including theme park rides and a hot-air balloon ride. Quite expensive but a good day out for the family. Popular with horse-lovers, the Haras National (National Stud Farm) is nearby at Lion d'Angers, where you can see many impressive horses of various breeds and learn about their breeding, upkeep and training. The kangaroo park (Jardin des Kangourous) near Savennieres 20 kilometres west of Angers is sure to be a success with the children.